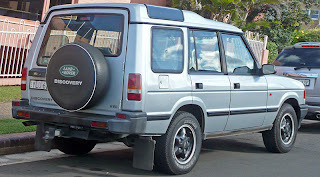 The Discovery was introduced into the United Kingdom in 1989. The company code-named the vehicle "Project Jay". The new model was based on the chassis and drivetrain of the more upmarket Range Rover, but with a lower price aimed at a larger market segment and intended to compete with Japanese offerings. 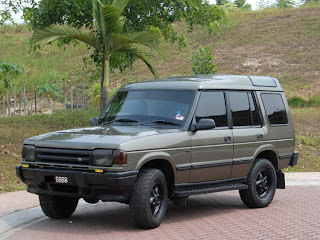 This was the only Discovery generation with four-cylinder engines. The Discovery was initially available only as a three-door version and the five-door became available the following year. Both were fitted with five seats, with the option to have two further seats fitted in the boot. Land Rover employed an external consultancy, Conran Design Group, to design the interior. The brief was to ignore current car interior design and position the vehicle as a 'lifestyle accessory'. The interior incorporated a number of original features, although some ideas shown on the original interior mock-ups constructed inside a Range Rover bodyshell at Conran's workshops were left on the shelf, such as a custom sunglasses holder built into the centre of the steering wheel. The design was unveiled to critical acclaim, and won a British Design Award in 1989. The features that were retained included the majority of the interior being constructed from 'Sonar Blue' plastic (with blue cloth trim), map/magazine holding slots above the windscreen, hand-holds for rear passengers being incorporated into the head restraints of the front seats, remote radio controls on the instrument cluster, twin removable sunroof panels (including a special zip-up storage bag behind the rear seats) and the inclusion of a Land Rover-branded cloth fabric holdall in the front centre console for oddments storage that could be removed from the vehicle and worn as a 'handbag' using a supplied shoulder strap (relatively few of these bags have survived, making them collectable items). Despite such features the interior's basic structure was the same as the Range Rover and virtually all the switchgear and instruments came from other Rover Group cars such as the Maestro and Montego. Similarly on the exterior, as well as the necessary Range Rover panels, the Discovery used headlights from the Freight Rover van and taillights from the Maestro van. The latter would continue to bear the Austin Rover 'chevron' logo on their lenses until production of the first generation Discovery ended in 1998, ten years after Austin Rover ceased to exist. Pre-1994, the Discovery was available with either the 2.5 litre 200 Tdi engine or the 3.5 litre Rover V8. Early V8 engines used a twin SU carburettor system, moving over to Lucas 14CUX fuel injection in 1990. In the North American market, the only engine available was the V8. A 2.0 litre petrol engine from the Rover stable was briefly available in a model known as the 2.0 L Mpi I4. This was intended to attract fleet managers, since UK (and also Italian) tax laws benefited vehicles under two litres. A combination of changes in taxation and the engine being underpowered for such a heavy vehicle led to the demise of this engine, despite the kudos of being the engine fitted to several Discoveries supplied to the British Royal family, most notably driven by Prince Philiparound Windsor Great Park, in his position as Park Ranger of the park. 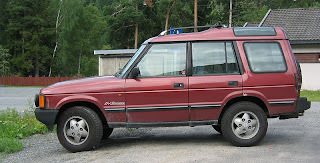 In 1992 the Discovery received several additions and improvements. The interior was now offered in a more traditional beige as well as the distinctive (but controversial) light blue, an automatic transmission was made available on 200Tdi models, new colours were added to the range (and the large 'compass and mountain' side decals worn by early Discoveries to disguise wavy panel fit around the rear three quarter windows were no longer fitted) and the 'SE' pack incorporating alloy wheels, front driving lights, roof bars and a special range of metallic paints was introduced as an option. 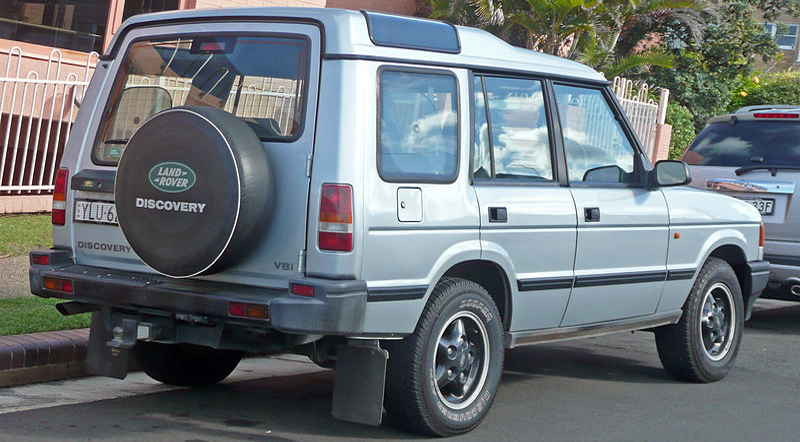 A two-seater, three-door Discovery Commercial version, lacking rear side windows, was later offered by Land Rover Special Vehicles. 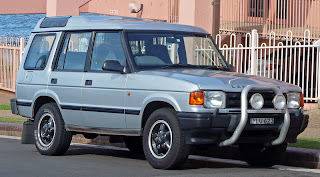 In 1994, many changes were made to the Discovery and reached some markets as "Discovery 2"; the 200Tdi and 3.5 L V8 engines were replaced with the 2.5 L 300TDi 4-cylinder and 3.9-litre Rover V8 engines, the 300Tdi introducing a Bosch electronic emissions control for certain models and markets. At around this time a stronger R380 gearbox was fitted to all manual models combined with the flexible cardan coupling GAJ-1 from SGF for more comfort. The newer models featured larger headlamps and a second set of rear lights in the bumper. The new rear lights had the wiring changed several times to meet real or expected European safety legislation. Some vehicles are left with an arrangement where the vulnerable bumper contains the only working direction-indicator lights; other examples have these lights duplicated in the traditional rear pillar location. The designers of the original model had been forced to economise and use the "parts-bin" of the then parent-company, Rover. The 200 series used the basic bodyshell structure from the Range Rover, door handles from the Morris Marina, tail lights from the Austin Maestro van, and interior switchgear and instrumentation from the Rover "parts bin". The 1994 model year marked the first year that the Discovery was sold in the United States. Airbags were incorporated into the design of the 1995 model to meet the requirements of US motor vehicle regulations, though they were not fitted as standard in all markets. 1995 models sold in the US utilised the 3.9-litre V8 from the Range Rover SE models, and later models saw a change to the 4.0-litre version of the engine. Technically speaking, the 1996 to 1998 US models with 4.0-litre engines had the same displacement as the 3.9-litre engines fitted to the earlier 1994 to 1995 US models; the differences between the engines involved improvements to the block rigidity and pistons, and a change from the Lucas 14CUX engine management to the distributorless Generic Engine Management System ("GEMS"). In earlier 3.9-litre US engines the fuel injection computer (14CUX) did not control the ignition, which was instead controlled by a traditional system with ignition coil and distributor made by Lucas. The 4.0-litre engines had a few important differences: larger, cross-bolted main bearings, revised pistons, revised intake and the GEMS system. It was developed jointly by Lucas and SAGEM and it controlled both spark and fuel injection. Unlike the earlier systems fitted to Rover V8 engines, GEMS was made OBD-II compliant. This change was largely driven by the federal requirement (starting in 1996) for vehicles sold in the United States to meet the OBD-II specification. 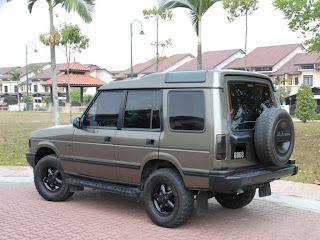 As with all Land Rover vehicles designed since the Land Rover Series, which had switchable two-wheel and four-wheel drive, the transmission is a permanent four wheel drive system, with alocking centre differential at the transfer box. In common with much of the rest of the Land Rover range, the handbrake acts on the transmission at the back of the transfer box, therefore locking all wheels when applied. In the Republic of Ireland, local tax laws meant that the first ever example of a Discovery Commercial (van) was launched there in 1991. A revised version was launched in 1993, shortly after the UK market example of late 1992. The Irish examples have formed the basis of the Discovery's success and high sales there, as most of the Commercials up to 2011 were virtually tax exempt. Last updated on 21 August 2013 at 20:00.